Amaretti (pronounced "am-ah-REHT-tee") is the Italian name for macaroons, which means little bitter things. These domed-shaped cookies are crisp and crunchy on the outside and soft and chewy inside. They originated in Venice Italy during the Renaissance period. These Amaretti cookies are made with almond paste, along with sugar and egg whites, and can be flavored with chocolate or liqueurs. Traditionally these cookies were served with a sweet dessert wine or liqueur, but they are also a wonderful accompaniment to a bowl of ice cream, sherbets, or mousses. Oftentimes, two baked cookies are sandwiched together with ganache, buttercream or jam. Another favorite way to use these cookies is to finely grind them and then add them to desserts (such as trifles) for added texture and flavor. 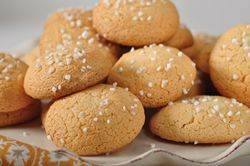 As I mentioned above, these Amaretti Cookies are made with almond paste which is a combination of equal parts ground blanched almonds and sugar, mixed with glucose, corn syrup or egg whites. It has a pliable yet grainy texture with a sweet almond flavor. Sold in both cans or tubes, my preference is the canned variety as I think it has a superior taste. As a side note, almond paste is also used in pastry making and confectionery to cover cakes and pastries, as well as forming into different shapes and figures. Any unused portions of almost paste can be wrapped in plastic and refrigerated or else frozen. While the recipe calls for making the batter in your food processor, you can use an electric stand mixer or hand mixer to make the batter.